Today we offer two expert perspectives on subsidizing nuclear power. Here’s the argument against providing economic support by Peter Bradford, Adjunct Professor Vermont Law School. Courtesy The Conversation. 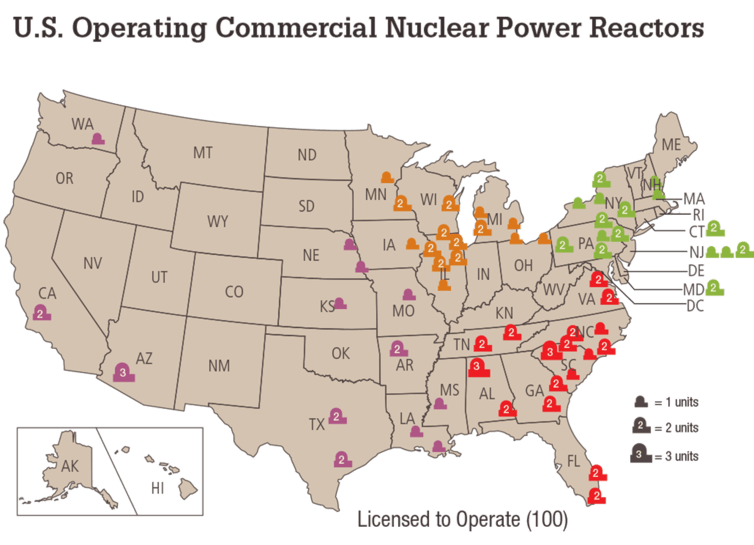 Since the 1950s, U.S. nuclear power has commanded immense taxpayer and customer subsidy based on promises of economic and environmental benefits. Many of these promises are unfulfilled, but new ones take their place. More subsidies follow. Today the nuclear industry claims that keeping all operating reactors running for many years, no matter how uneconomic they become, is essential in order to reach U.S. climate change targets. Economics have always challenged U.S. reactors. After more than 100 construction cancellations and cost overruns costing up to US$5 billion apiece, Forbes Magazine in 1985 called nuclear power “the greatest managerial disaster in business history…only the blind, or the biased, can now think that most of the money [$265 billion by 1990] has been well spent.” U.S. Atomic Energy Commission (AEC) Chair Lewis Strauss’ 1954 promise that electric power would be “too cheap to meter” is today used to mock nuclear economics, not commend them. As late as 1972 the AEC forecast that the United States would have 1,000 power reactors by the year 2000. Today we have 100 operating power reactors, down from a peak of 112 in 1990. Since 2012 U.S. power plant owners have retired five units and announced plans to close nine more. Four new reactors are likely to come on line. Without strenuous government intervention, almost all of the rest will close by midcentury. Because these recent closures have been abrupt and unplanned, the replacement power has come in substantial part from natural gas, causing a dismaying uptick in greenhouse gas emissions. The nuclear industry, led by the forlornly named lobbying group Nuclear Matters, still obtains large subsidies for new reactor designs that cannot possibly compete at today’s prices. But its main function now is to save operating reactors from closure brought on by their own rising costs, by the absence of a U.S. policy on greenhouse gas emissions and by competition from less expensive natural gas, carbon-free renewables and more efficient energy use. Only billions more dollars in subsidies and the retarding of rapid deployment of cheaper technologies can save these reactors. Only fresh claims of unique social benefit can justify such steps. When I served on the U.S. Nuclear Regulatory Commission (NRC) from 1977 through 1982, the NRC issued more licenses than in any comparable period since. Arguments that the U.S. couldn’t avoid dependence on Middle Eastern oil and keep the lights on without a vast increase in nuclear power were standard fare then and throughout my 20 years chairing the New York and Maine utility regulatory commissions. In fact, we attained these goals without the additional reactors, a lesson to remember in the face of claims that all of today’s nuclear plants are needed to ward off climate change. During nuclear power’s growth years in the 1960s and 1970s, almost all electric utility rate regulation was based on recovering the money necessary to build and run power plants and the accompanying infrastructure. But in the 1990s many states broke up the electric utility monopoly model. Now a majority of U.S. power generation is sold in competitive markets. Companies profit by producing the cheapest electricity or providing services that avoid the need for electricity. To justify their current subsidy demands, nuclear advocates assert three propositions. First, they contend that power markets undervalue nuclear plants because they do not compensate reactors for avoiding carbon emissions, or for other attributes such as diversifying the fuel supply or running more than 90 percent of the time. Second, they assert that other low-carbon sources cannot fill the gapbecause the wind doesn’t always blow and the sun doesn’t always shine. So power grids will use fossil-fired generators for more hours if nuclear plants close. Finally, nuclear power supporters argue that these intermittent sources receive substantial subsidies while nuclear energy does not, thereby enabling renewables to underbid nuclear even if their costs are higher. Nuclear power producers want government-mandated long-term contracts or other mechanisms that require customers to buy power from their troubled units at prices far higher than they would pay otherwise. Providing such open-ended support will negate several major energy trends that currently benefit customers and the environment. First, power markets have been working reliably and effectively. A large variety of cheaper, more efficient technologies for producing and saving energy, as well as managing the grid more cheaply and cleanly, have been developed. Energy storage, which can enhance the round-the-clock capability of some renewables is progressing faster than had been expected, and is now being bid into several power markets – notably the market serving Pennsylvania, New Jersey and Maryland. Long-term subsidies for uneconomic nuclear plants also will crowd out penetration of these markets by energy efficiency and renewables. This is the path New York state has taken by committing at least $7.6 billion in above-market payments to three of its six plants to assure that they operate through 2029. While power markets do indeed undervalue low-carbon fuels, all of the other premises underlying the nuclear industry approach are flawed. In California and in Nebraska, utilities plan to replace nuclear plants that are closing early for economic reasons almost entirely with electricity from carbon-free sources. Such transitions are achievable in most systems as long as the shutdowns are planned in advance to be carbon-free. In California these replacement resources, which include renewables, storage, transmission enhancements and energy efficiency measures, will for the most part be procured through competitive processes. Indeed, any state where a utility threatens to close a plant can run an auction to ascertain whether there are sufficient low-carbon resources available to replace the unit within a particular time frame. Only then will regulators know whether, how much and for how long they should support the nuclear units. If New York had taken this approach, each of the struggling nuclear units could have bid to provide power in such an auction. They might well have succeeded for the immediate future, but some or all would probably not have won after that. Closing the noncompetitive plants would be a clear benefit to the New York economy. This is why a large coalition of big customers, alternative energy providers and environmental groups opposed the long-term subsidy plan. The industry’s final argument – that renewables are subsidized and nuclear is not – ignores overwhelming history. All carbon-free energy sources together have not received remotely as much government support as has flowed to nuclear power. Nuclear energy’s essential components – reactors and enriched uranium fuel – were developed at taxpayer expense. Private utilities were paid to build nuclear reactors in the 1950s and early ‘60’s, and received subsidized fuel. According to a study by the Union of Concerned Scientists, total subsidies paid and offered to nuclear plants between 1960 and 2024 generally exceed the value of the power that they produced. The U.S. government has also pledged to dispose of nuclear power’s most hazardous wastes – a promise that has never been made to any other industry. By 2020 taxpayers will have paid some $21 billion to store those wastes at power plant sites. Furthermore, under the 1957 Price-Anderson Act, each plant owner’s accident liability is limited to some $300 million per year, even though the Fukushima disaster showed that nuclear accident costs can exceed $100 billion. If private companies that own U.S. nuclear power plants had been responsible for accident liability, they would not have built reactors. The same is almost certainly true of responsibility for spent fuel disposal. Finally, as part of the transition to competition in the 1990s, state governments were persuaded to make customers pay off some $70 billion in excessive nuclear costs. Today the same nuclear power providers are asking to be rescued from the same market forces for a second time. Christopher Crane, the president and CEO of Exelon, which owns the nation’s largest nuclear fleet, preaches temperance from a bar stool when he disparages renewable energy subsidies by asserting, “I’ve talked for years about the unintended consequences of policies that incentivize technologies versus outcomes.“ However, he’s right about unintended and unfortunate consequences. We should not rely further on the unfulfilled prophesies that nuclear lobbyists have deployed so expensively for so long. It’s time to take Crane at his word by using our power markets, adjusted to price greenhouse gas emissions, to prioritize our low carbon outcome over his technology. For a contrasting view, see this article by Penn State University nuclear engineering professor Arthur Motta. Republished with permission from The Conversation, a great source of highly readable viewpoints from academics on a wide range of topics. Recommended. A rather disappointing & clearly biased attack on nuclear power. I’d like to see the author clearly present his alternative vision of competing energy systems , as opposed to simply designating nuclear. “biased attack”? …rather a knowledgeable attack by someone who could be characterised as an insider. Furthermore, I’d suggest that you did not read the article with care since the author did offer alternatives to nuclear. We know what these alternatives are & they are certainly far far cheaper & far far quicker to build than large atom bangers. That said – perhaps the nuke industry needs to look a SMRs which will be a better fit with the way the power industry is evolving. If those alternatives are really cheaper than nuclear, why are you so afraid to give nuclear equal treatment under policy (equal subsidy, etc..). Why are you so afraid to have them compete on a fair, level playing field? Nuclear has the same PTC subsidy in the 2005 Energy Act and some more subsidies through TVA and DoE. Those are for new plants. This article is about (possibly) subsidizing existing plants. Please elaborate on those additional TVA and DoE subsidies. Renewables get additional (and even larger) subsidies in the form of Renewable Energy Credits (RECs) in the many/most states that have renewable energy mandates. Of course, when you think about it, an outright mandate for renewable energy use (regardless of cost, practicality or if new generation is even needed) is essentially an infinite subsidy. The PTC for new nukes is very limited (it times out after 2020, and only covered a few plant’s worth of generation). The renewables PTC is limitless (in amount of power subsidized) and it keeps getting extended (probably indefinitely, such is their political power). Also, renewables can take the PTC in the form of a large, up-front payment (which can be used to cover most of the construction cost). Nuclear is not offered the same. If it was, the effect would be much larger (in reducing nuclear’s cost). You forget the nuclear liability limitation laws. Those greatly reduce liability for nuclear accidents and waste. The insurance premium reductions thanks to these laws, are major subsidies. Taking into account the damage caused by past accidents, the value of these subsidies is 1-5cent/KWh (the high value for old reactors). Nuclear emits >10 times more CO2eq/KWh than wind & solar as shown by independent studies referred in the Conservation. It may even be 50% of that of natural gas. So nuclear is not a real low carbon source. Following similar course as the tobacco industry, nuclear facilitated studies that nuclear is low carbon (forgetting factors). Per dollar, costs are near always associated with about the same amount of carbon emission as costs are in the end always labor. And workers spend their money more or less the same. So wind, solar, nuclear electricity all emit ~X grCO2eq/cent KWh. The marginal costs of wind and solar are smaller than $5/MWh. So sound reasoning implies that existing, depreciated NPP’s emit at least 14 times more CO2/KWh than comparable solar and wind! *) Special liabilities limitations acts limit nuclear’s liability for the costs of accidents and nuclear waste to unrealistic low amounts. created a damage of ~$2Trillion. A subsidy of $133mln per reactor year, which translates to ~1.7cent/KWh. Nuclear waste liability limitation add another ~0.5cent/KWh. UN organizations are pro-nuclear biased. Probably because the atomic powers finance ~90% of their budget, and the excellent lobby of the nuclear industry. So more independent (from the UN) organizations arose, such as the Codex Alimentarius Commission, and independent world nuclear status reports are now published. Ah, yes, only Bas an anti-nuclear people are unbiased. No one should trust the UN, IPCC, IEA, UNSCEAR, WHO, etc. on most anything. They work for the man. It’s so easy to make arguments when you don’t have to refute facts, just call major bodies and 100s of scientists from around the world biased. It’s just that easy. Both you and KM only refer to statements of the IPCC, etc. I didn’t see any argument which tries to show that my sound reasoning is wrong. I pointed out that your reasoning is not “sound”. When you don’t like facts, you claim those facts must be due to the bias of the source, in this case, all U.N. organizations. Yet you have nothing to offer to back up your claim of bias other than: 1) your claim that U.N. disaster estimates are somehow not to your liking; hence, must be wrong, and 2) the old canard about the 1959 WHO-IAEA agreement that says that the agreement somehow makes the WHO subservient to the IAEA (which it clearly does not). So, yes, when you resort to old conspiracy theories without any evidence to back them up, I don’t bother with the rest of your “sound reasoning”. 1) Too many studies. published in peer reviewed scientific journals, showed high health damage due to Chernobyl in areas that are excluded by the UN organizations because such health damage in far away areas would be impossible. E.g. this rock solid study in an area 1000mile away. The bad thing is that those studies were published when they made that judgment! 2. About a year ago I read an half page at the WHO site denying the agreement had any influence. Still they hadn’t the guts (power) to modify the agreement or to end it! Why would they have such agreement only with the IAEA whose official target is to promote peaceful nuclear. but not with e.g. the FAO which affects their work far more, and requires far more cooperation? Apparently the share of their budget paid by Atomic Powers is still too high…. Bas, as for your first point: One mathematician’s “study” 1000 miles away trumps a myriad of local studies over decades that were reviewed by the IAEA, FAO, UN-OCHA, UNDP, UNEP, UNSCEAR, WHO the World Bank and 100s of scientists, economists and health experts. Sorry, I just can’t buy into that sort of argument. As for you second point, you are still unable to articulate how on earth the agreement you question makes the WHO subservient to the IAEA. There is no such language in the agreement. Your attempt to imply that there is such an arrangement because the FAO has no such agreement with the WHO is just not sound reasoning. As for your comment that the WHO gets 70% of its budget paid by “Atomic Powers”, I have no idea where you got that notion. Even if it were true, the WHO is just one of numerous organizations and (as I said before) 100s of scientists, economists, and health experts that have been involved in studying Chernobyl. The scale of the conspiracy you are advocating is beyond belief. This study found cancer increases in much farther away N-Sweden. Bas, there are always those who don’t agree with the scientific consensus. It’s the same with climate change. You are obviously biased. You don’t explain your “70%” comment, nor your insistence that the WHO is subservient to the IAEA, nor how that even relates to Chernobyl given the numerous agencies involved, nor why hundreds of scientists from around the world would collude to hide the truth about radiation. Your beef is with the scientific community, not me. Important share of scientists do not agree with the IAEA/WHO estimates. Hence the many studies that show much higher health damage. So there is no scientific consensus regarding this subject. Also complete BS is the 2 $trillion estimate for nuclear releases. Just making stuff up… Fukushima was the only significant release outside the old Soviet Union (Chernobyl being no more applicable to modern/non-Soviet nuclear than it is to wind power). And Fukushima’s cost is on the order of $100 billion (and it’s only that high because of unjustified over-reaction). Dividing that by the number of nuclear kW-hrs generated yields an “accident cost” of ~0.1 cents/kW-hr, not 1.7 cents. Please read the emission studies referred to in this overview article. Now, 5yrs thereafter, optimistic estimate for Fukushima predict that it takes 50yrs to clean. No real total cost estimation. Also because we still don’t know the situation inside, etc. All unmanned robots sent inside failed (supposedly due to the high radiation). So I estimate that my $2trillion for all accidents is rather low. Bas, it appears that your last reply to me has pushed the reply indentation to the limit, as I see no “Reply” button for your last reply. So I’ll reply here instead. I’ll look deeper into my comment on “scientific consensus”; e.g., see if I can quantify it, then get back to you. “Nuclear energy cheaper than other energy sources“??? Why then all those subsidies? It’s clear that most other sources are cheaper. The recent Dutch tender (~€60/MWh) showed that now even offshore wind became >2times cheaper. She states that nuclear power caused an increase of only ~0.2% in global back ground radiation. Suggesting that it doesn’t hamper health. With ~2mSv/a background, you get 140mSv in in 70years. Which delivers IMHO a chance of >5% to die due to radiation. Also because radiation causes more illnesses as shown by many studies such as LSS. Bas, sorry for the delayed response. Geraldine Thomas is a health physics expert, not a nuclear power expert, though nuclear power can be cheap or cheaper than renewables–or not. It depends on many factors. Really? I reviewed lots of the video to try to find what you are talking about, but I don’t find it. One of her major points is that you simply can’t infer anything from low dose radiation. There’s just way too much noise to get a statistically valid measure. And what data we have strongly suggests there is a threshold below which radiation has little or no effect on causing cancers. So you go on to make the classic error of extrapolating deaths from a .02% increase in background radiation to an increase of 200,000 cancers. If you really believe that (and that the LNT model–never proven–is accurate down to single collision of a radioactive particle with a biologic one), do you advocate shutting down the airline industry? No other industry workers are exposed to as much increase in background radiation. Pilots and flight attendants should be dropping like flies according to you. Aren’t you terribly upset that we continue to allow an airline industry? Or why do we continue to allow people to live in areas of high background radiation. I mean, isn’t it amazing that anyone is still alive in Finland? Shouldn’t we have evacuated Finland long ago due to high background radiation. Of course I’m being sarcastic, but I do wonder where your deep concern is as to all the radiation sources that are much higher than from nuclear power. If you believe what you are saying, why wouldn’t you advocate shutting down the airline industry? I finally got a chance to dig in. All I can say is I don’t think you understand what a “rock solid” study is. The paper takes no account of confounders and simply focuses on one possible cause–ionizing radiation. For all toxins there is a relationship between dose and effect – the paper provides no evidence of dose to individuals, just an association (not attribution) to environmental levels of radiation. You are obviously a very smart fellow. I urge you to rethink why you are sold on the kind of junk science in the article you referenced. You have yet to provide any solid evidence on the conspiracy theories you have presented (such as WHO being subservient to the IAEA, and 100s of scientists from dozens of countries all conspiring to make false claims that benefit the nuclear industry). And you have not yet said anything about the anti-nuclear lobby. They have spent 10s of millions of dollars (if not hundreds of millions of dollars) trying to prove their fear of radiation has a basis in reality (thanks to many wealth donors). Some organizations, such as Greenpeace, create their own “science” unit so they can “prove” that their morally superior position is correct and that the rest of the scientific community is wrong. Don’t fall for it. The future depends on people getting this right. Hi Bas, your linked article in the conversation is rubbish. It provides no references and makes unsupported / unfounded claims. It is not scientific evidence to ” state ” or ” report ” something as a fact, you have to provide evidence of the fact . He claim that nuclear emits 10 times as much CO2 as wind/solar has no basis in fact. The only evidence you’ve demonstrated to date is that you have a closed mind in relation to the nuclear issue. Follow the references to find the actual studies. You may also use sound reasoning as I showed in my comment above.